Fort Raleigh National Historic Site is known for its Roanoke Colony, the first English settlement in what is now the U.S., established in the 1580s. Roanoke is thought to have run out of supplies and failed sometime around 1590, and by the time ships arrived with supplies, the colony had disappeared. 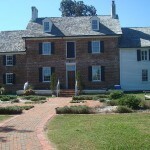 Fort Raleigh National Historic Site is believed to be haunted by the ghost of Virginia Dare, the first English child born in the New World. It was around 230, a sunny day, and no one was around at the moment. i had just read about the freemen’s colony on Roanoke Island and stepped on the path to the visitor’s center when I am sure something whispered to me? I didn’t understand the words but I didn’t feel scared except for the fact I’d just been whispered to.